Posted on Sunday, February 25th, 2018 at 12:13 am. Paul Component Engineering loves Sierra Nevada. 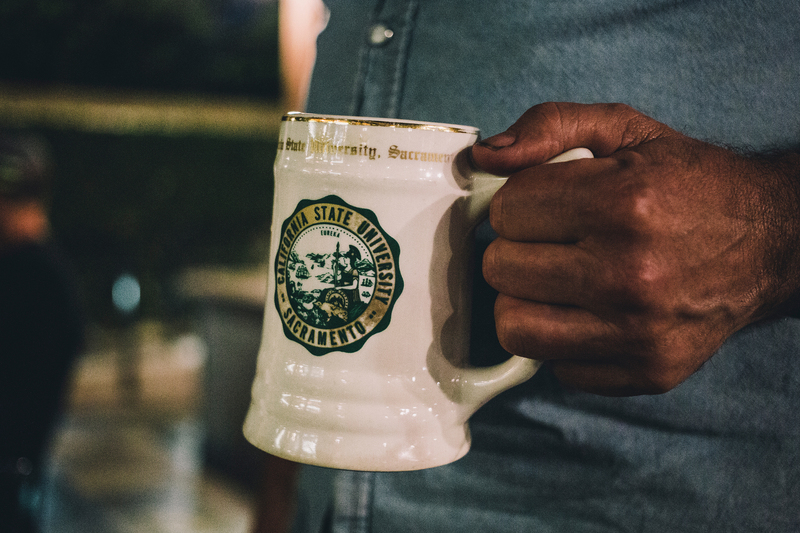 As a matter of fact, founder Paul Price loves it so much that not only does he has his own personal mug on standby at the brewery. He also took a whole a bunch of us on a tour while attending Paul Camp last year. Needless to say, I drank a lot of Sierra Nevada that weekend. So it’s no surprise Paul is partnering with the legendary brewery (at last) for an one-off show bike featuring the best of NorCal creativity and American manufacturing… a idea conceived while brainstorming for the most fun way to go on a beer run… yes, a brainstorming sesh about a beer run. The bike is built on a Squid Shred To Ed’s BMX frame custom-painted by Squid, with a White Industries drivetrain and anodized Sierra Nevada Pale-Ale green components by Paul, of course. Sierra Nevada once had a successful cycling team in the early 2000s and they continue to be a huge supporter of the sport. Squid Bikes co-founder Chris Namba workin it. The final build will be unveiled at Sea Otter Classic in Monterey this coming April so stay tuned for updates! Posted on Monday, October 2nd, 2017 at 4:29 pm. Besides rows of beautiful bikes for all to see, one of my favorite things to do at InterBike is to walk (semi) aimlessly around the show floor and see where it leads me to. Often even the most mundane booth can have something cool out in the open. There’s nothing better than seeing the product in person. I liken it to going on a treasure hunt on nothing but bikes. It has been teased over the past year or so, but the White Industries headsets are finally here. Stainless Enduro bearings match the U.S.-made aluminum cups and hardware in six different colors, plus 3 top cup sizes and 3 bottom cups to cover the majority of the popular headset standards. The headset will range from $100-160 depending on sizing and colors. If their hubs are any indication of their performance, then these beauties should work very well for a very long time. The market is flooded with hubs these days. If you’re curious about all that goes on inside a hub, then this box of DT Swiss cutaways should give you a sense of that. Various freehub bodies, hubcaps, and their upgradable ratchet engagement system in three flavors: 18t/20 degree, 36t/10 degree, and 56t/6.6 degree. There are heat moldable insoles and shoes but now Landyachtz is making moldable saddles. The Canadian longboard company surprised quite a few with the reform that incorporates a USB plug at the underside of the shell to allow the integrated heating unit sandwiched between the carbon shell and high-density foam to warm up, thus making it pliable. Molding is then done with the rider using the saddle atop a stationary trainer and is ready in about twenty minutes time. Landyachtz will offer three different saddle shapes for $299 with molding session available at participating shops. In short, Stages is finally offering a dual-sided option of their powermeter after years of teases. Existing Stages users will be familiar with the measuring pod on the non-drive side crankarm. 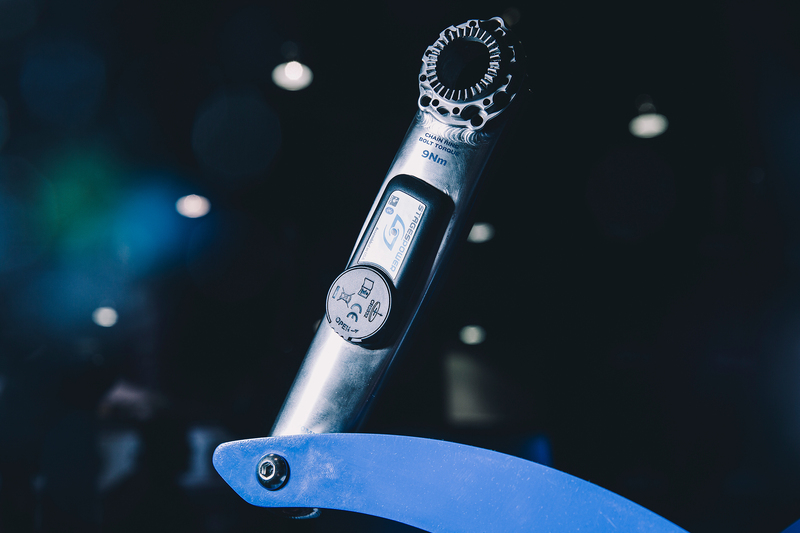 What’s new with the LR is the drive-side measuring unit, a mere 20 gram addition that is situated below the crankarm for those who want bilateral power monitoring. Functionality wise, it works just like their original unit with 2% accuracy at 100 watt/90rpm, ANT+ and Bluetooth compatibility, updatable firmware, plus 175 hours of use on a user-replacable battery placed within an IPX 7 water resistant pod. It will be available this fall with Shimano Dura-Ace 9100 ($1299) and Ultegra R8000 ($999) cranksets. Brake specialist TRP showed off their new TT hydro disc brake system specifically made for time trial/triathlon bikes. The lever is (of course) carbon connected to an asymmetrical body wrapped in a grippy replaceable rubber hood. As TRP is not in the drivetrain business, their engineers have come up with a design that can integrate either SRAM eTap blips or Shimano Di2 remote climbing switch (below). The levers then connect to their Hylex calipers on non-toxic mineral oil with quick connect hoses for ease of maintenance. The brakes will sell for $199 each. When I first saw the Ergon ST Core Ultra Saddle I immediately thought that foam layer looked awfully similar to some popular German running shoe. Turns out my suspicion was correct. It is a layer of expanded thermoplastic polyurethane called Infinergy. It’s a lightweight closed-cell elastic foam developed by chemical giant BASF which has been made mainstream by the Adidas Boost series of shoes. To implement into the saddle, Ergon employs a layer of Infinergy foam as a damper between two hard shells (instead of one) where the rigid bottom shell bears the load and connects to the rails while the flexible upper shell supports the padding which allows the foam beneath to better respond to pressure. The ST Core Ultra will be available for $149.99 this coming Spring. The idea of a 1×13 drivetrain isn’t new as it’s been floating around since 1×9 grew to 1×12. There isn’t anyone making production runs of 1×13 (yet) but the 1×13 drivetrain at the Phil Wood booth is sure cool to gawk at. It’s a bit of a hodge podge mixture consisting of a Shimano 11-40 11-speed cassette added with OneUp 46t and 50t cogs which are then mounted to a custom freehub body on a 150mm wide hub. The drivetrain is driven with a modified XTR mechanical derailleur with an upgraded OneUp Shark cage mounted to an offset adapter to accommodate the extra required cable pull. No word on pricing or whether it’ll ever make its way to production.